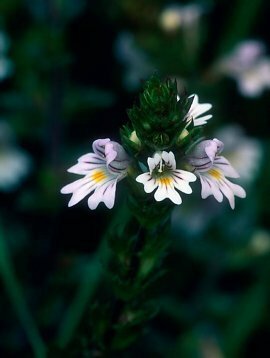 The genus name Euphrasia derives from the name of Euphrosyne, one of the Three Graces or Charites; she was the goddess of joy. The name refers to the joy a person would feel when his or her vision was improved from using eyebright. Native to Europe, eyebright is a small annual herb, reaching a height of only 2 to 8 inches. The leaves are deeply toothed, oval, and pubescent and the stems are square. The small hermaphroditic plants are white with yellow and purple spots. Eyebright is semiparasitic, in that its roots attach to those of grasses. It does best in open areas, such as pastures. The flower of eyebright somewhat resembles a bloodshot eye, which may have been part of the reason ancient peoples valued this plant for treating eye ailments. Appearances aside, eyebright is beneficial for the treatment of many ailments of the eye. It stimulates the liver to clean the blood, dries dampness, curbs discharge, and reduces inflammation, thereby clearing the eyes and head and relieving conditions that congest visual clarity. It has an antihistamine-like effect and is a specific for mucus discharge from the eyes, ears, and nasal passages. Eyebright is used to treat allergies, blepharitis, cataracts, catarrh, conjunctivitis, cough, earaches, eye inflammation, eye irritation (itchiness and watering), eyestrain, hay fever, headache with congestion, head cold, hoarseness, jaundice, leukorrhoea, memory loss, ophthalmia, photophobia, rhinitis, sinusitis, sore eyes, sore throat, styes, vertigo, and weak vision. Topically, a tea or the fresh-pressed juice of eyebright can be used as an eyewash, compress, or nasal wash to relieve irritation in the eyes and nose. It also can be used as a poultice to encourage the healing of wounds. Eyebright leaves, though slightly bitter, can be eaten raw. The dried leaves of the plant are sometimes included in smoking mixtures. Eyebright is generally regarded as safe. In cases of serious eye disorders, however, eyebright is best used under the guidance of a qualified health-care professional. Avoid eyebright in cases of extreme congestion, as it may be worsened by eyebright's astringent properties. Avoid during pregnancy.